It can be a full time task to find scholarships for which you may qualify. As we receive scholarship information, it will be updated on this site under the 2018-2019 Scholarship List below, so please check the website often for updates. In addition, colleges often have many more scholarships about which we are not informed. Please visit the College/Career Planning page to find information about TN Promise and FAFSA. Please request scholarship/financial aid information from the schools you are interested in attending by contacting their Financial Aid Offices or visiting their scholarship/financial aid websites. Many schools’ scholarship deadlines are early December so start planning now so you don’t miss their deadlines!! The Scholarships below are currently accepting applications. Please read the eligibility and application instructions on the website carefully before applying. Levine Scholars Program- (full, 4-year tuition +) The Levine Scholars Program seeks exceptional high school seniors who demonstrate a commitment to community service, hold an academic record that reflects a sustained passion for knowledge and possess a capacity for ethical leadership that elevates fellow students to a higher standard. Scarlett Family Foundation Scholarships- Opens September 15 (up to $15,000) open to high school seniors and college freshmen, sophomores, and juniors who will graduate or have graduated from a public, independent or homeschool association high school in 40 Middle Tennessee counties. The Beauty + Wellness Scholarship for Women- Quarterly Deadlines: January 1, March 31st, June 30th, and September 30th every year ($1,000) Must be a female, graduating high school senior. Pretty Photoshop Actions Bi-Annual Scholarship- April 15 & October 15 ($500) Carefully research and compose an essay style Adobe Photoshop tutorial of 800 to 1,000 words, with screenshots and photos included to illustrate your points..
Levine Scholarship- October 8 (four year scholarship) The Levine Scholars Program seeks outstanding high school seniors who are eager to embark on a transformative college experience. Students must be applicants for freshman enrollment at UNC Charlotte in an undergraduate program for the fall term immediately following their high school graduation. Buchanan Fellowship- December 1st (tuition waiver, book fees, and more) For students with an ACT score of 29 or above and a GPA of 3.5 or above. B.Davis Scholarship- May 21, 2019 ($1,000) This Scholarship is available to all high school juniors and seniors as well as all students currently registered in any post secondary institution. MTSU Scholarships- December 1 The Presidential Scholarship for ACT 25-29 & 3.5+ GPA receives $4,500 per year. Trustee Scholarship for ACT 30-36 & 3.5+ GPA receives $5,000 per year. Imagine America Scholarship- 2.5+ GPA, and also be committed to community service and financial need. 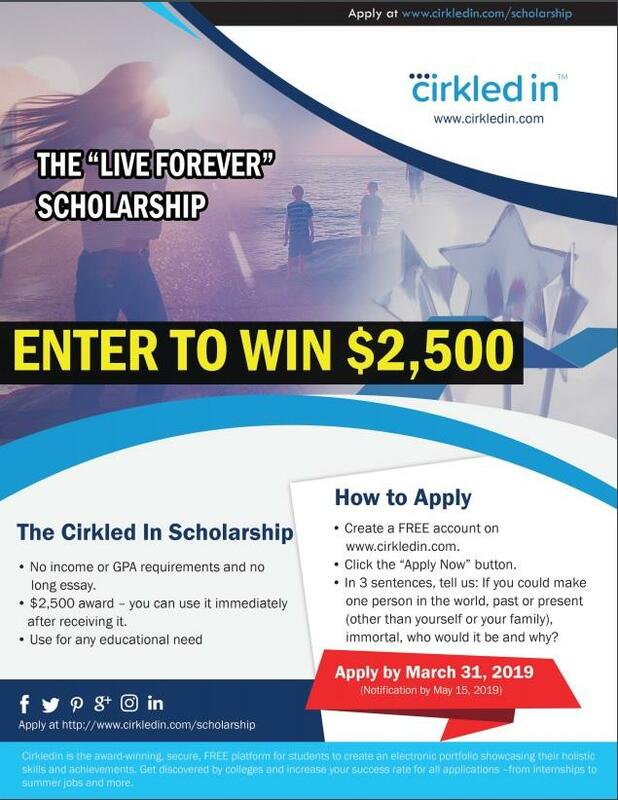 Sheltia S. Murray Scholarship- April 27, 2019 ($1000) 3.0 GPA & 22 ACT minimum. The Rutherford Education Association Scholarship- April 20, 2019 (&1,000) A one-time scholarship to a deserving Rutherford County senior student who expresses an interest in pursuing a career in education. Application in the counseling office. Quest Bridge- The 2018 National College Match application is now open. The deadline to apply is September 27, 2018.